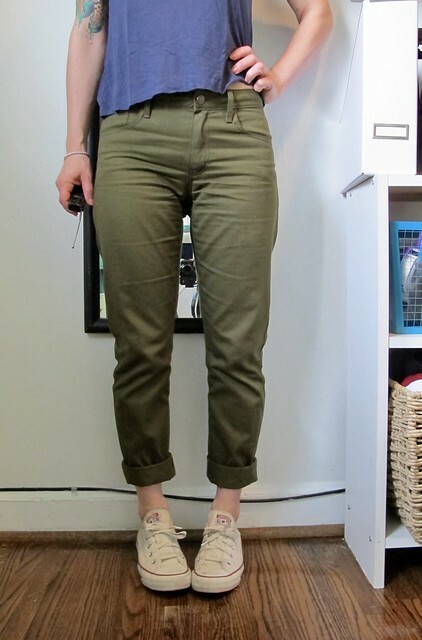 I don’t think it’s a big secret just how much I love the Organic Cotton Twill that Mood Fabrics sells. 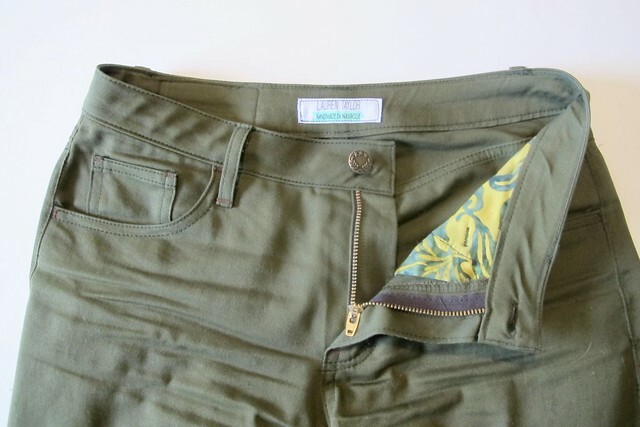 Over the years, I have sewn my share of pieces using this wonderful fabric (pants, shorts, and my recent jacket!) – it truly washes and wears beautifully, and comes in a fantastic array of colors! I am always looking for another excuse to use this fabric, it’s that good! 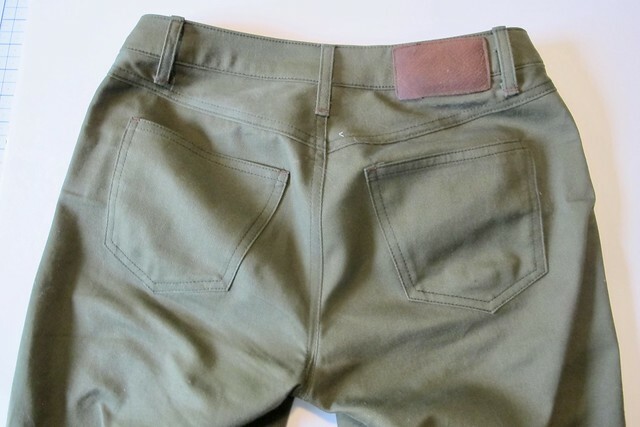 I still had quite a bit of the Olive Organic Cotton Twill leftover from the aforementioned jacket – about a yard and a half – so I thought I would use it to make a pair of pants. 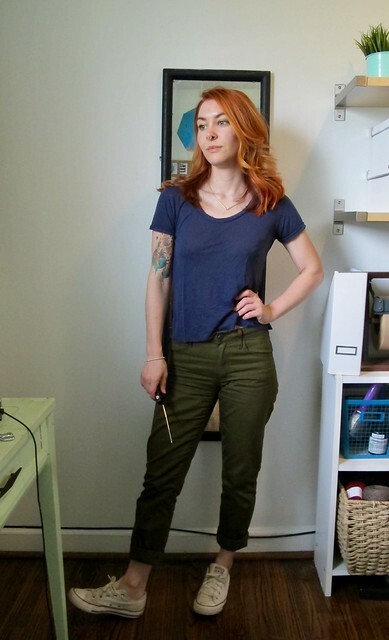 I generally tend to wear pants that have a lot of stretch – like, secret leggings (I say secret because they look like Adult pants with pockets and fly zippers, but ooh the stretch is like a pair of yoga pants HAHA) – but I was open to trying something new. Since my twill only has a little bit of mechanical crosswise stretch (i.e., no lycra in this stuff! ), I chose the Closet Case Patterns Morgan Jeans, as that pattern is drafted for woven fabrics. This particular pattern is actually intended to be made with denim – hence the name – but I feel that a good-quality medium weight cotton twill can certainly be interchangeable with a medium-weight denim. This first make is my “wearable muslin” for this pattern – while I’ve made other patterns from this company before, this is my first time with this particular one. Since I already had the leftover twill burning a hole in my stash, it made sense to use that for this project instead of buying a new piece of fabric. Making this pattern out of twill isn’t really any different than using denim, in terms of process, although it might be a hair easier. Since the twill isn’t super thick (it is bottom-weight, but 3-4 layers of this stuff still easily fits under my presser foot without much of a struggle), I didn’t have any issues with any of the sewing. An 80/12 Universal needle is perfectly suitable for this fabric, and you don’t have pound down layers to reduce bulk (I’m looking at you, belt loops). I topstitched everything with a matching olive thread, but I used a triple stitch instead of topstitching thread. Pressing was probably the best part – this stuff is pure cotton, and it presses and steams up like a dream! Other than the snafu with the sizing (FWIW, I did cut my regular size 2 – as I do with all other patterns from this company – but I think the issue here is that I’m *technically* between sizes so I should have gone up a size. Anymore, more info about that when I post about this on my own blog! ), the rest of the fit is really good straight out of the envelope. 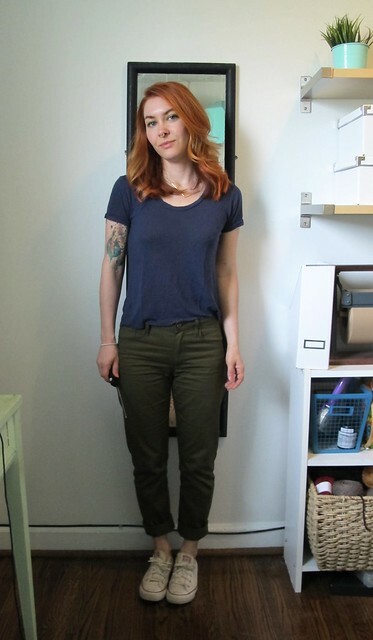 The legs are quite long – I think the inseam is about 32″ which LOL is like 4″ too much inseam for me – but it is easy enough to cut that off before you hem. These are hemmed to be full-length pants, but I like the way they look rolled up, too!